Will public records be the end of New York’s horse-drawn carriages? Police departments have struggled for years with harassment and litigation (both threatened and actually filed) from animal rights activists protesting their use of dogs in K9 or horses in mounted type units. This week, a particular case in New York has come to a head and resulted in a judge ordering the New York Police Department to drastically revise the way in which they handle public records requests with regards to incidents surrounding the treatment and safety of their horses. At the center of the controversy right now are horse-drawn carriages, operated by the NYPD. Animal rights groups and activists have tried for some time to get the police to turn over records with regards to incidents involving the horses they employ, but to no avail. A lawyer for the Animal League Defense Fund, or ALDF for short, has stated that despite repeated requests for these records over the past year, the police department has not handed over a single document. This past Monday, a judge ordered police to turn over their documents instead of continuing its (apparent) current policy of dodging or ignoring requests for this information. In addition to obtaining records period, those requesting these public records are asking that the police not be able to blur the definition of “relevant” documents when handing over information. 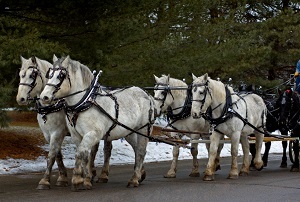 In addition to veterinarian visits and records, those requesting documents also want to be able to see other incidents listed out in plain sight – every year a number of crashes occur in which horses fall over, collide with other carriages, injure pedestrians, injure themselves, and even cause or become involved in motor vehicle accidents. The NYPD has skirted these cases by giving a narrow doctor’s definition to “health” records, and the judge ruled that this distinction was “humorous,” and would no longer be accepted. Not even a week earlier, on April 23rd, a horse-drawn carriage overturned outside the Plaza Hotel in New York City and pinned down the horse pulling it until officers could detach the carriage and help it up again. The horse was immediately put back to work, and officers dispute tourist reports that the horse was limping when it was righted. While the carriages have been a staple of New York street culture for decades, many citizens are concerned that horses and traffic just don’t mix, and that the practice has long passed its prime. Current New York City mayor Bill de Blasio stated that he hoped to suspend horse-drawn carriages during busy periods shortly after he took office, with plans to eventually permanently discontinue the practice. While the NYPD has issued no official statement on the matter, individual officers interviewed have maintained that the horses enjoy a high quality of life with four to five doctor’s visits per year and plenty of time off. As per order of the judge, the department has 45 days to fully comply with current requests for public records regarding their horse-drawn carriage related incidents, along with the presumed expectation that future requests will be met with similar accommodation.